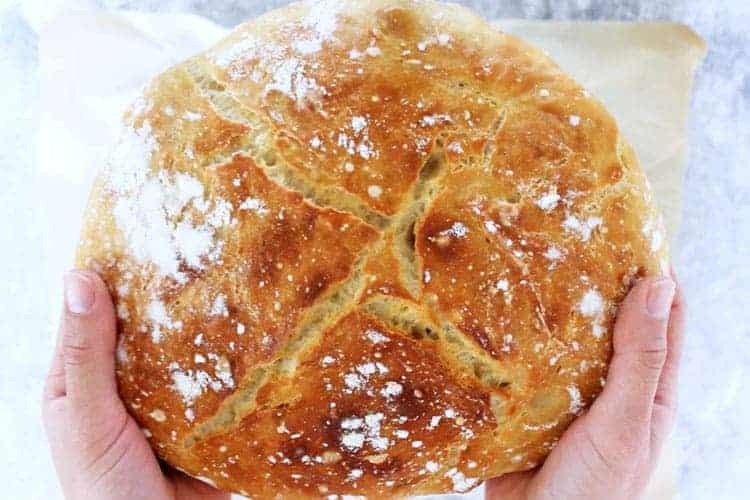 Kicking off the Monthly Bread Baking Challenge with this super easy, 4 ingredient, crusty No-Knead Bread recipe! Mix the ingredients, leave overnight, shape and bake the next day! You’ll all be bread makers in no time! Welcome to the first Monthly Bread Baking Challenge! 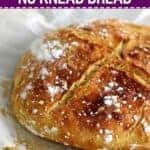 At the beginning of each month I will post a new recipe for a different type of bread. We will start slowly, and work out way up to more complicated recipes. 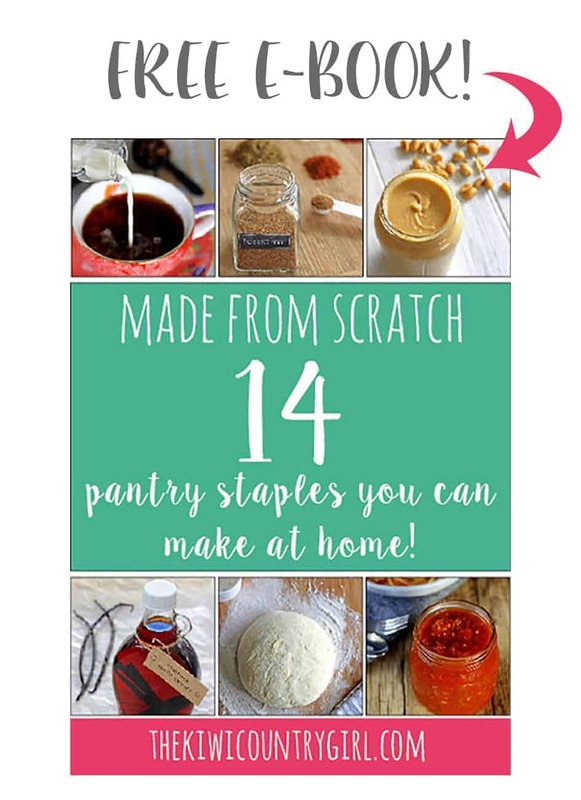 Each recipe post will be accompanied by step by step photos and instructions, tips and tricks and a video showing you exactly how to do it. So let’s get right into it! Homemade, crusty no-knead bread! This loaf of bread is what kicked my homemade bread addiction back into full gear. 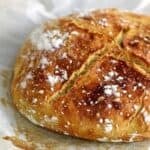 My sister came to visit a few weeks ago and she had made a loaf of this bread – it was SO delicious! I made her send me the recipe before she left, I made a loaf that night and haven’t stopped making it since! 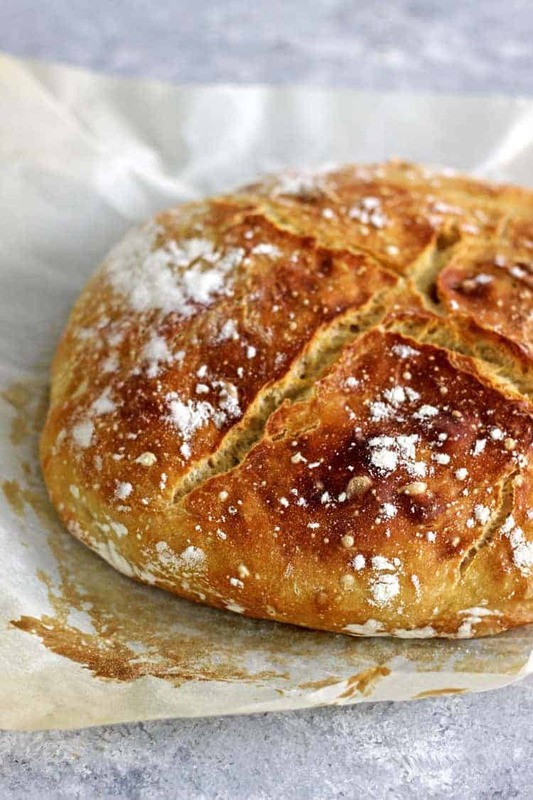 This no-knead bread is the perfect starting point for beginner bread bakers. As the name suggests, there is no kneading involved! 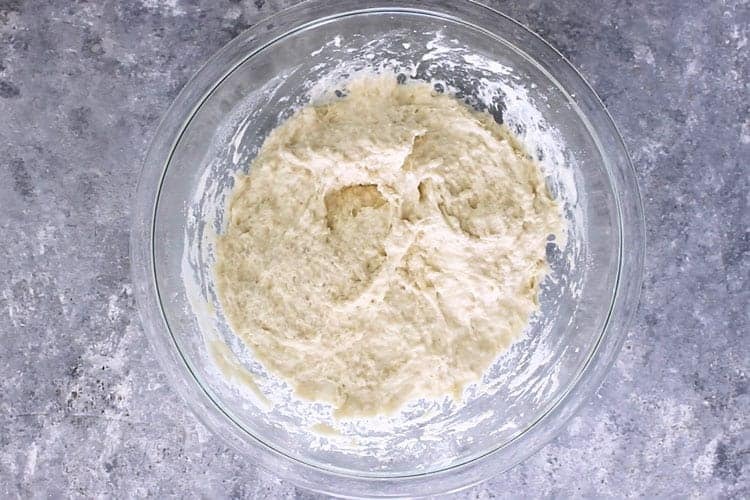 It’s a really simple matter of mixing together 4 simple ingredients that I bet you have already – plain flour, active dry yeast, salt and water. See?! The key with this bread is a really long rise time. And I mean LONG! Anywhere from 8 to 24 hours. If I want the bread ready for lunch, I mix up the dough the night before and bake it in the morning, but if you don’t need it until dinner time you can start the dough in the morning and bake in the afternoon. 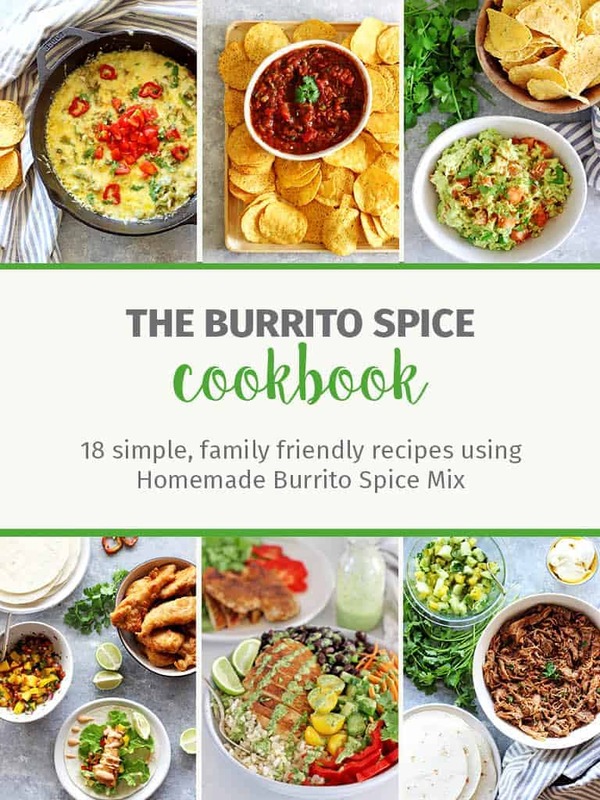 This is definitely not an original recipe – I played around with this recipe that my sister uses but in the end, there was nothing wrong with it at all and I couldn’t improve it, so why fix it if it ain’t broke?! A heavy oven proof dish with a lid. A cast iron dutch oven is ideal for this, but a roasting dish with tinfoil on top will also work. Step 1: Mix together the 4 ingredients – plain flour, active dried yeast, salt and water. It will form a pretty wet looking shaggy dough. This is perfect. Step 2: Cover it and leave it to rise for 8-24 hours. The long rise time is how you get away with no-kneading. 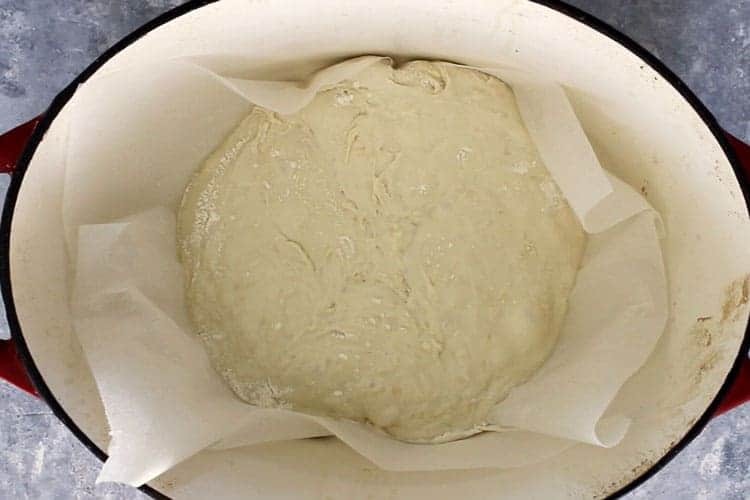 The long rise time allows the yeast to really do a good job in creating lots of little air pockets in the dough which leads to a nice tender bread. Step 3: Turn the bread out onto a well floured piece of baking paper. 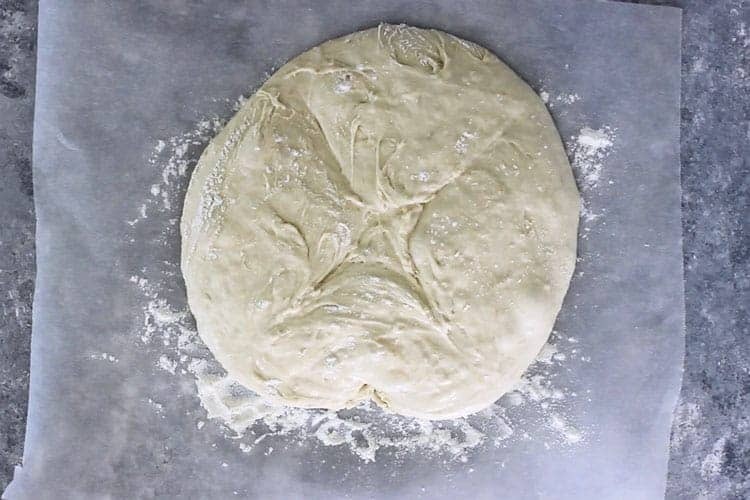 Use your hands to shape it into a round loaf. Leave it to rest again. While it is resting, take either a cast iron dutch oven or a roasting dish and place it in the oven as you preheat it. This gets the oven and the baking dish nice and hot which helps kick start the cooking process. Step 4: After the bread has rested for 30 minutes, take a sharp knife and slash an X in the middle. 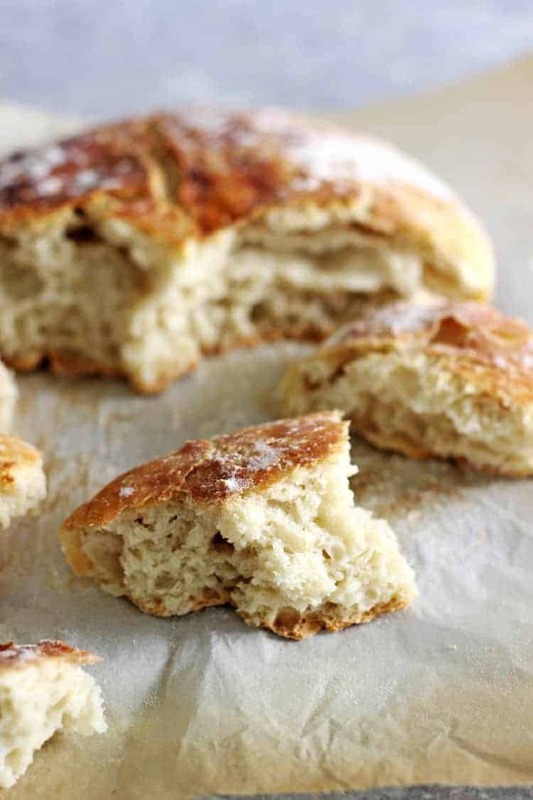 Remove the baking dish from the oven and lift the baking paper and loaf of bread and place them right into the dutch oven or baking dish and put the lid on. Bake for 30 minutes covered, then take the lid off and bake for a further 15 minutes. Step 5: Wait for the bread to cool down enough to touch and eat! If it is cooler where you live, use warm water to give it a boost. This isn’t essential and it will still work using cool water but in the middle of winter when you are leaving it on the bench overnight, I’ve found using warm water helps a lot. Active dried yeast is what I use but instant yeast or Surebake yeast will also work. If using Surebake yeast, you will just need to use 1 teaspoon instead of only 1/2 teaspoon. 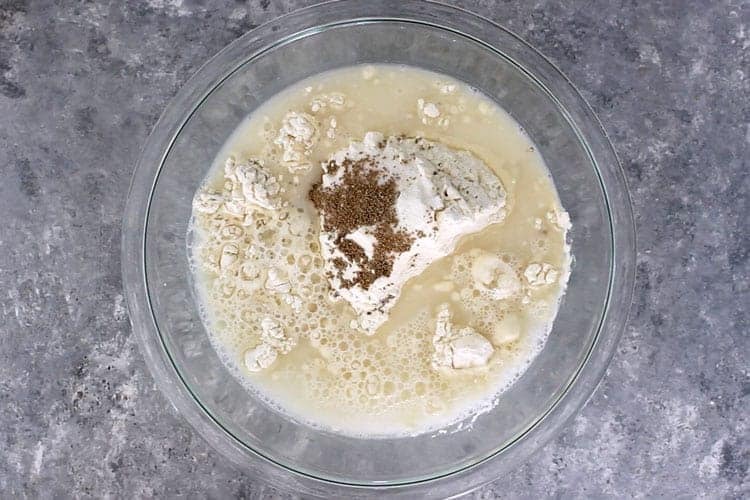 Instant yeast can be directly substituted. If you don’t have a cast iron dutch oven/casserole dish, use a roasting dish covered in tinfoil. 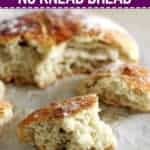 This is what my sister uses and her bread turns out perfectly! Using a serrated knife to create the X on the top is easier for me than just a regular sharp knife. I can’t wait to see how you get on! And if you make this, don’t forget to comment below, email me a picture or share on Facebook or Instagram and tag it #thekiwicountrygirl. Also, if you happen to have any leftover, this bread makes the BEST garlic bread! Slice it, spread with butter and crushed garlic and put under the grill for 10 minutes. Perfect! 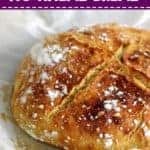 The most amazing 4 ingredient crusty no-knead bread recipe! Add all ingredients to a medium sized mixing bowl and stir to combine. Cover and leave to rise at room temperature for 8-24 hours. While the bread is resting, place a cast iron dutch oven or other heavy oven dish with a lid (see recipe note 3) in the oven and heat the oven to 220°C/430°F. Once the bread has rested, use a sharp knife to slash an X in the middle of the loaf. I find that using a serrated knife gets a cleaner cut. Using oven mitts, remove the dutch oven or oven dish from the oven and carefully place the baking paper with the bread in the dish. Place the lid on (or cover with tinfoil) and bake for 30 minutes. Remove the lid and bake for a further 15 minutes. Remove from the oven and allow to cool before slicing and eating! I use active dry yeast but instant yeast or Surebake yeast will also work. If using Surebake yeast, you will just need to use 1 teaspoon instead of only 1/2 teaspoon. Instant yeast can be directly substituted. You can use room temperature water but I have found that if it is colder where you are (e.g. in the middle of winter) using warm tap water gives the bread a nice little boost. 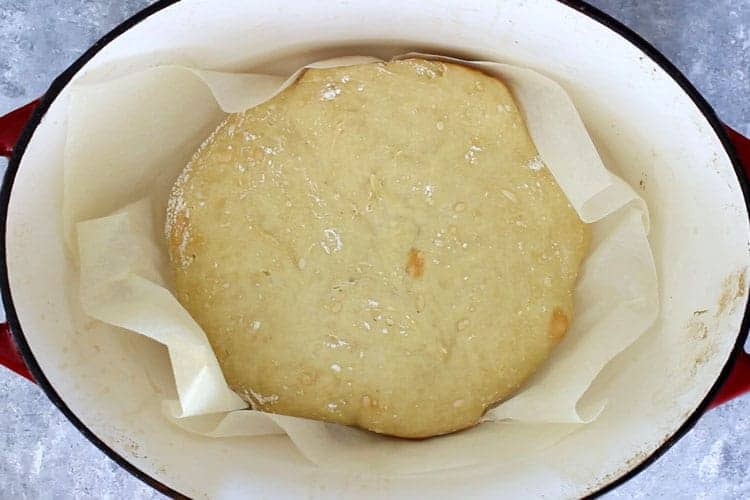 A heavy cast iron dutch oven with a lid is what I use to bake the bread, but if you don't have one, my sister uses a roasting dish with tinfoil as a lid and this works perfectly well too. Use what you have! Hi Ruth! That’s great, I’m so happy you love the bread! Great question – I haven’t tried this! It may need an extra 15 minutes or so as I imagine the loaf tin will have a smaller surface area than the casserole dish, so it will be a more compact loaf. I would check it after 45 minutes, but if it looks like it needs longer, probably an hour (total) would be plenty. I’m interested to try this now too, I might actually do it overnight tonight and let you know how I get on! I left the dough overnight in quite a warm kitchen and now it’s so liquid that I can’t shape it – any ideas what I can do? Hi Lorraine, I would still cook it and see how it goes…keep me posted and if it didn’t work we will try to figure out what might have gone wrong!